After groups of extremist illegal Israeli colonizers attacked homes and residents in the center of Hebron city, in the southern part of the occupied West Bank, Israeli soldiers turned the area into a closed military zone to the Palestinians, literally imprisoning them in their homes. 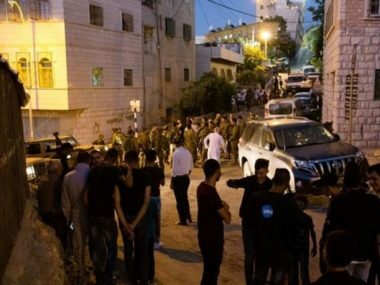 The Israeli measure came after groups of fanatic colonists gathered in Tel Romedia neighborhood, and the Shuhada Street, in the heart of Hebron city, and organized protests calling for removing every Palestinian from the area. The fanatics came from several illegal colonies in Hebron, and other parts of occupied Palestine, while the soldiers started imposing further restrictions not on the assailants, but on the Palestinian natives of the occupied city. The attacks witnessed a serious escalation over the last two days with more extremists arriving in the city to participate in these violations. 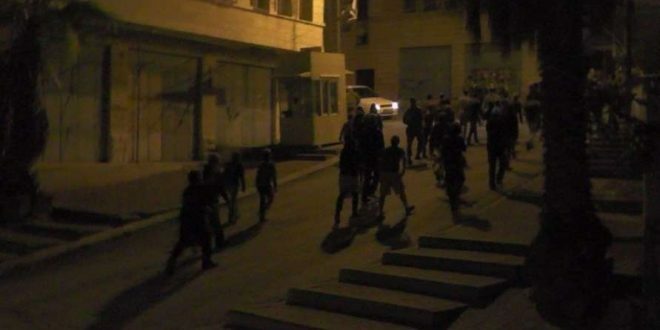 On Friday evening, a group of extremist colonizers attacked Palestinians in Tal Romeida neighborhood, while Israeli soldiers stood and watched, before attacking the Palestinians, and abducted one of them. Israel is in the process of enacting laws that would allow it to formally annex parts of the occupied West Bank, in serious violation of international law, a United Nations expert said on Friday, according to WAFA. UN Special Rapporteur on human rights in the occupied Palestinian territory, Michael Lynk, said, after a fact-finding tour of the region, that he was gravely alarmed about the deterioration of human rights in the Occupied Palestinian Territory (OPT), saying that reports received during his visit to the region, this week, painted the most dispiriting picture yet, of the situation on the ground. Lynk travelled to Amman, Jordan, this week, where he met with Palestinian civil society, government officials and UN representatives, after Israel prevented him from entering the OPT. His mission was to collect information for his next report, to be presented to the 73rd session of the General Assembly, in October of 2018. “This is my third mission to the region since I assumed the mandate in May 2016, and the reports I received this week have painted the bleakest picture yet of the human rights situation in the OPT,” he said. 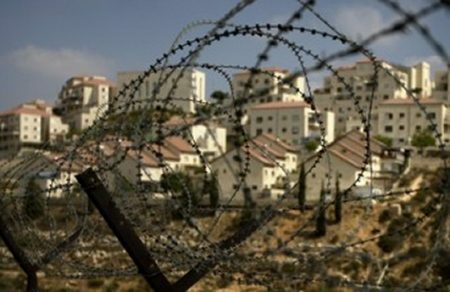 “Palestinians in the West Bank face daily indignities, as they pass through Israeli checkpoints, face night raids of their homes, and are unable to build or expand their homes or work to develop their communities due to the complex system which makes building permits nearly impossible to obtain from the Israeli authorities,” the Special Rapporteur said. Lynk cited the situation of Khan al-Ahmar, a Bedouin community near Jerusalem, which is at imminent risk of forcible transfer after the Israeli High Court of Justice upheld a demolition order for all structures in the community. “Its residents are living in a coercive environment that may lead to forcible transfer, not knowing where they may find themselves in the coming months and not knowing if they will be living in a place where they are able to continue their traditional way of life,” he said. Lynk further stated that the situation in Gaza has continued to worsen, highlighting that the electricity crisis, for example, which became acute last June, had not been alleviated. “Residents are deprived of their most basic rights, including the rights to health, to education, and most recently, in attempting to exercise their right to freedom of expression and peaceful assembly, they were deprived of the right to life,” Lynk said, in reference to the recent demonstrations along the fence during which Israeli security forces killed more than 140 and wounded thousands of Palestinian protesters. He also expressed concern about the impact of significant cuts to the funding of UNRWA, the UN agency that helps Palestinian refugees, noting its crucial role in providing health, protection and education services as well as employment in Gaza and the West Bank. The Special Rapporteur heard eloquent testimony of the challenges facing the Palestinian residents of East Jerusalem, and expressed concern at information he received, recently, stating that the Israeli government and the West Jerusalem municipality have been advancing plans which risk denial of the residency rights of 120,000 Palestinians in the municipality, as part of a larger policy to maintain an Israeli Jewish majority in Jerusalem. The Rapporteur was particularly concerned at information he received, this week, which indicated that many human rights organizations and human rights defenders – Israeli, Palestinian, and international – are facing increasing attacks aimed not only at their delegitimization, but at their ability to operate. Israeli soldiers abducted, Sunday, a Palestinian detainee from occupied East Jerusalem, instantly upon his release after spending a prison sentence of 11 months. The detainee, Rami Saleh al-Fakhouri, from the Old City of Jerusalem, was released from the Negev detention camp, but was re-arrested and taken prison in front of the prison gate. 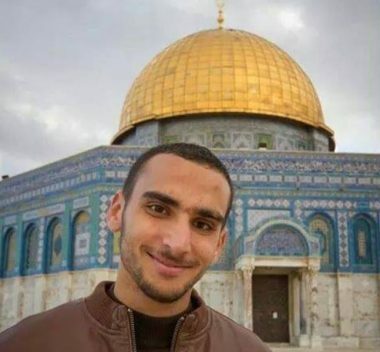 It is worth mentioning that al-Fakhouri was previously frequently abducted and imprisoned by Israel, including being held under Administrative Detention orders, without charges or trial, for protesting ongoing assaults and provocative tours by Israeli colonists in the Al-Aqsa Mosque. His last imprisonment was on August 23rd, 2017 when was sentenced to eleven months in prison. Several years ago, al-Fakhouri was seriously injured in his face, and lost one of his eyes, after being shot while he and other Palestinians pretested an invasion into the holy site. Tunisia’s Ennahda Movement has decried calls aimed to urge Muslims to boycott the annual Hajj pilgrimage in Saudi Arabia. Calls have recently grown in Tunisia demanding the issuance of a fatwa to prevent Tunisians from going to the holy lands in Saudi Arabia to perform the Hajj ritual. Supporters argue that the ritual has become too expensive and that revenues are being used by Saudi authorities to stage wars in Muslim countries. “These are isolated and ideological calls that only serve personal purposes,” Ennahda said in a statement. It warned that such calls would lead to strain relations between Tunisia and Saudi Arabia. Last year, nearly 11,000 Tunisian pilgrims performed the annual ritual, which costs around 12,000 Tunisian dinars ($4,583 USD). Saudi Arabia is leading an Arab coalition that launched a massive air campaign in 2015 against Shia Houthi rebels, which overran much of Yemen, including capital Sanaa a year earlier. “Russian jets are burning people and stone, while the Iranian and Assad militias are committing war crimes,” Mustafa said. He questioned the commitment of the friends of the Syrian people to support the FSA groups and stand on the side of the Syrian people in their struggle to regain freedom and dignity. Two Palestinian civilians were killed and eight others injured in an explosion at an eastern neighbourhood of the Gaza Strip, the Palestinian Health Ministry said on Saturday. The incident took place in Shejaiya neighbourhood after fireworks exploded, said Ashraf al-Qidra, the ministry spokesman, in a statement. The situation has been tense across the Gaza fence amid rallies by Palestinians against Israeli occupation of their lands. Since the rallies began on March 30, at least 135 Palestinians have been killed, and thousands more injured, by Israeli armygunfire, according to the Palestinian Health Ministry. Protesters demand the “right of return” to their homes in historical Palestine from which they were driven in 1948 to make way for the new state of Israel. They also demand an end to Israel’s draconian blockade of the Gaza Strip, which for the last 11 years has gutted the coastal enclave’s economy and deprived its 2 million inhabitants of many basic commodities. Israeli settlers continued their assaults on the residents of Tel Rumeida in Hebron’s old city, for the second day in a row. Settlers, under supervision of army, prevented citizens from reaching their homes and assaulted them in front of the soldiers’ eyes. Head of the Tel Rumeida committee, Bassam Abu Eisha, said that there is a fierce attack on the people of Tel Rumeida in coordination between the settlers and the Israeli army. “The army launched an attack against the citizens by preventing them from reaching their homes, preventing entrance of visitors from outside the area, while the settlers attack homes, children and women,” he said. “As activists, we note that there is a new Judaization policy in the areas adjacent to the settlements, an obvious increase in the number of checkpoints, a return to the policy of numbers and names, the prohibition of entry of non-residents from checkpoints, and repeated attacks by settlers and the army together,” said activist Ezzat al-Karaki. The number of Palestinians martyred by Israeli gunfire since the beginning of protests on 30 March has climbed to 135, according to Palestine’s Health Ministry. Ashraf al-Qidra, a ministry spokesman, told Anadolu Agency that more than 15,000 people have been injured during the protests in Gaza. Around 370 injured people are in critical condition, Al-Qidra said. “2,536 of those injured are children and 1,160 are women,” he said, adding that 231 medical staff and 175 journalists were among injured. The Palestinians had begun staging mass rallies along the Gaza-Israel security fence on 30 March. They demand the “right of return” to their homes and villages in historical Palestine from which they were driven in 1948 to make way for the new state of Israel. The protesters also demand an end to Israel’s decade-long blockade of the Gaza Strip, which has gutted the coastal enclave’s economy and deprived its 2 million inhabitants of many basic commodities.